Just how successful is that investment? 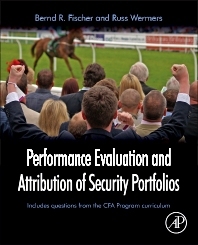 Measuring portfolio performance requires evaluation (measuring portfolio results against benchmarks) and attribution (determining individual results of the portfolio's parts), In this book, a professor and an asset manager show readers how to use theories, applications, and real data to understand these tools. Unlike others, Fischer and Wermers teach readers how to pick the theories and applications that fit their specific needs. With material inspired by the recent financial crisis, Fischer and Wermers bring new clarity to defining investment success. Features practice problems formerly from the CFA Program curriculum. Financial economics MA, MBA, and Ph.D. students studying asset pricing, portfolio management, financial management, and risk management. 1.5 Does proving the CAPM wrong = Market inefficiency? Or, do efficient markets = the CAPM is correct? 9.3 Does Active Management Add Value? 12.3 Multi-period Attribution Analysis According to Brinson et al. In 2009, Bernd Fischer was appointed to the position of Managing Director of IDS GmbH - Analysis and Reporting Services (a subsidiary of Allianz SE), one of the largest internationally operating providers of operational investment controlling services for institutional investors and asset managers. From 2000 to 2009, he was Global Head of Risk Controlling and Compliance in the central business segment Asset Management of Commerzbank AG and was also responsible for the operational Risk and Performance Controlling division of cominvest GmbH. Prior to this, he worked in the fields of Portfolio Analysis and Risk Controlling in the Asset Management division of Dresdner Bank. From 2000 to 2004, he was a member of the Investment Council of the CFA Institute. Dr. Fischer completed his degrees in Physics and Mathematics at the University of Cologne and was awarded his doctorate at the Florida Atlantic University (USA) in 1995. Managing Director of IDS GmbH - Analysis and Reporting Services (a subsidiary of Allianz SE). Russ Wermers is an Associate Professor of Finance at the Smith School of Business, University of Maryland at College Park, where he won a campus-wide teaching award during 2005. His main research interests include studies of the efficiency of securities markets, as well as the role of institutional investors in setting stock prices. Most notably, his past research has developed new approaches to measuring and attributing the performance of mutual funds, pension funds, and hedge funds, as well as devising winning strategies for investing in these funds. Professor Wermers received his Ph.D. from the University of California, Los Angeles, in 1995.